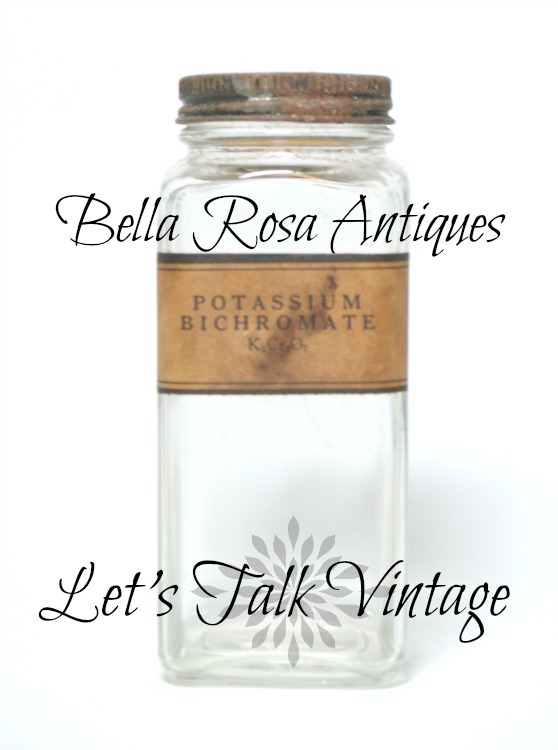 Bella Rosa Antiques: Let's Talk Vintage #103: The Store Tour & Our Latest Upcycled Furniture Projects! 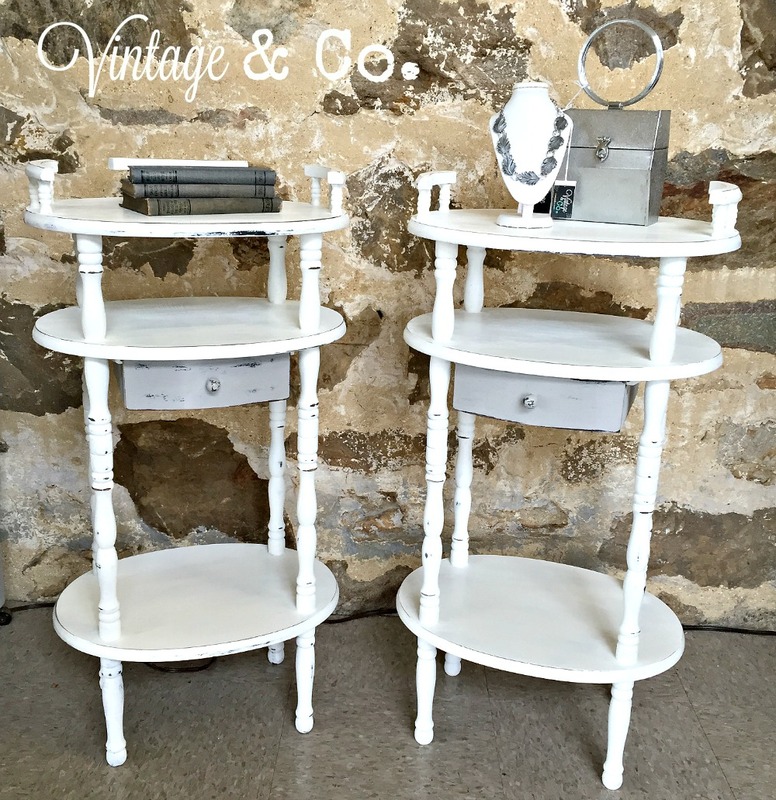 Let's Talk Vintage #103: The Store Tour & Our Latest Upcycled Furniture Projects! Hello, hello! This past week just flew by, from last week's LTV, didn't it? Well, if you love vintage feel free to join in the fun this week! Link up your blog posts or link to vintage things you sell, we don't mind. This week I am gearing up at my brick and mortar shop for a shopping tour which is fun and exciting, but it is also a lot of work on the shop's part. 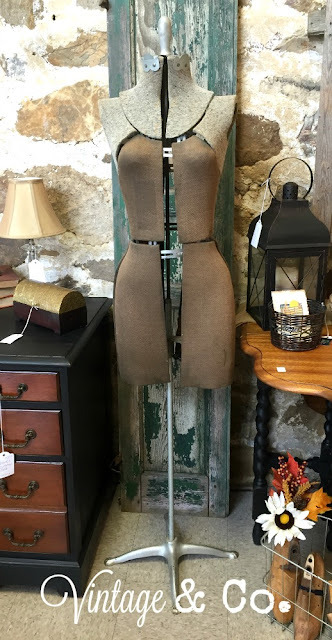 We anticipate lots of new faces and customers stopping in so I will be reporting all of the events that take place, back here on my blog, as well as my Vintage & Co. blog. My hours will be extended and we will not be closed at all during the tour so I will need to "eat my Wheaties" to keep up the energy! 'a peek into the projects we worked on recently. brush to paint the top. I kept hearing "Nooooooo!" I must have raised the brush about 3 or 4 times. 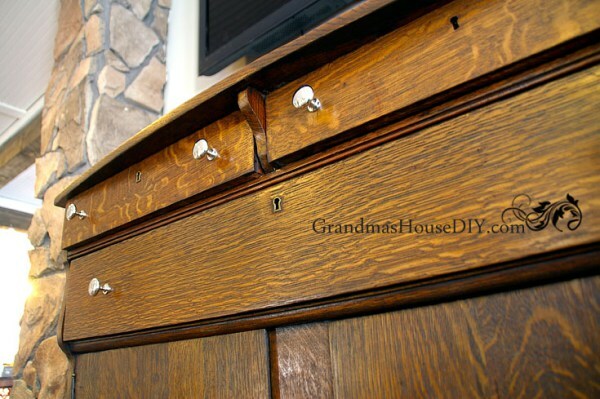 know, I'd like to keep the top a nice wood grain and just paint the bottom with chalk paint. I really think the top of this table is its redeeming quality. and brought it to the store. I just love how it looks now! 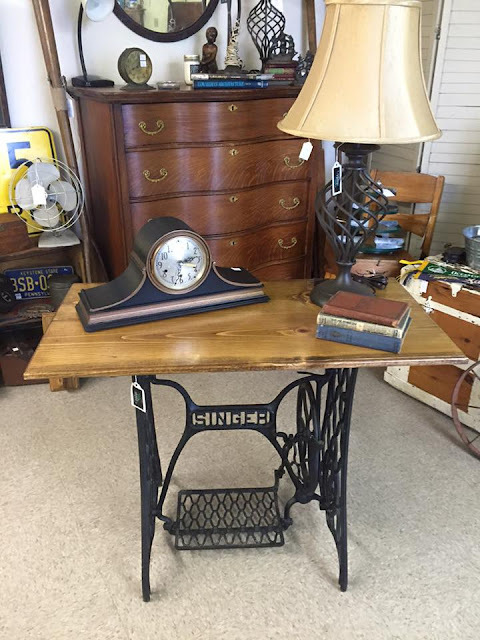 These sweet little stands were kind of drab before, in your typical dark brown stain. I love them now, too! And the last project was my hubby's. of it that was hand painted but not in a good way. Really didn't go together at all. He decided to make it into a table. or even in an entry way. her base color... like a caramel candy! family and finds a new use for them. pretty cool and lights up too! mix of textures and some creative styling. Lots of neat ways to use metal containers! If you were featured, feel free to use this graphic on your next blog post or on your blog side bar. Thanks so much for linking up and for stopping by to check out LTV each week! Now it's your turn... Let's Talk Vintage! 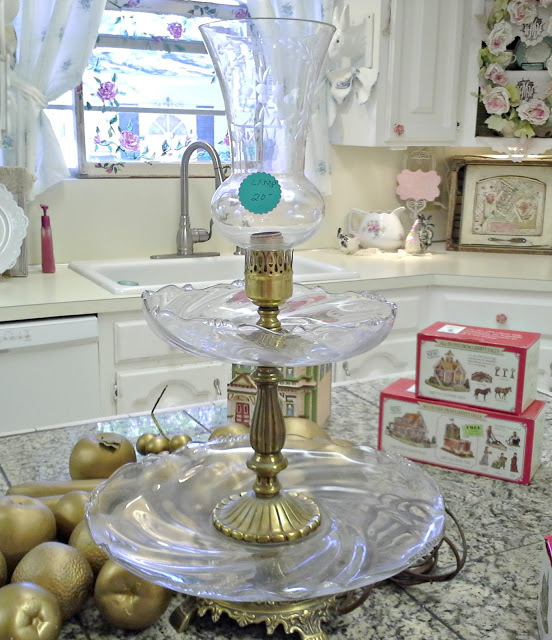 What a nice surprise to see my three tiered stand included in your features this week....thank you so much! Have a great week! Thanks Jillian for Lets Talk Vintage 103, love seeing the photos of your store and you and your husbands refinished/painted furniture. Thanks so much for hosting , Jillian! I just love the pie crust table with the natural wood-grain top! And you've got to be kidding....Carmella was on the side of the road??! Others' wastefulness is ours to thrift, thank goodness! Thanks for hosting us, Jill. Love your new dress form Jill! I just had to pay $25 for a very similar one :) Thanks for the party! Thank you for featuring my Grandma's buffet today!! Jillian - thank you for hosting. 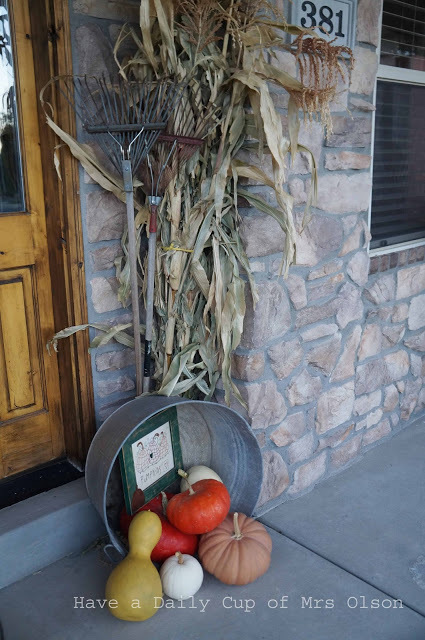 Some beautiful autumn vignettes and projects here. See you next week! 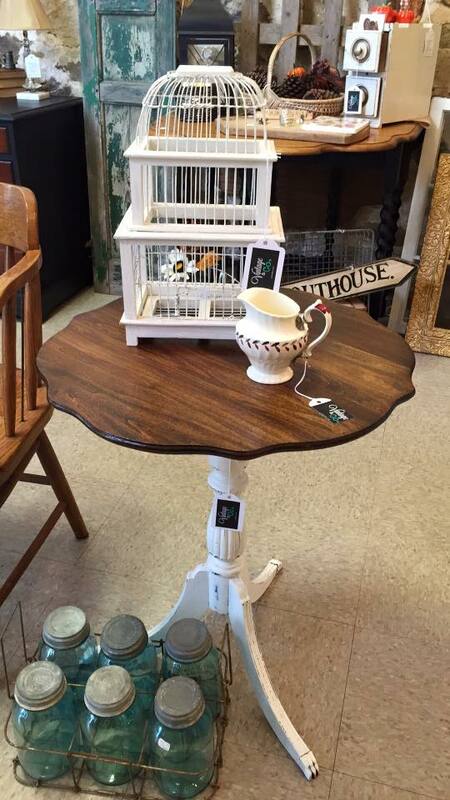 Jillian I love all your treasures and do agree the table is lovely with the woodgrain top and painted base! Jillian, I love that your husband helps you with your projects. Mr. Deanie does when he has time and since he retired from his day job and is now a full-time farmer, he can help me more. Thank you for hosting. Looking forward to more photos of your wonderful shop! Love your refinished pieces! That small table top is beautiful....your hubby did a great job. Great features this week too! I think Carmella looks wonderful. I have her sister Sally who is blue instead of caramel colored.